A great get away to the Appalachian Mountains and the great Creeper Trail. 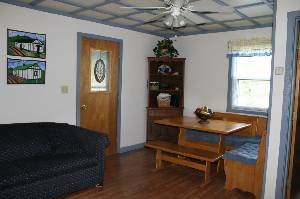 Green Cove Getaway is a spacious contemporary one-bedroom bungalow, additionally furnished with a queen-sized bed, small daybed and studio couch,(makes a queen size bed) two twin size beds in the loft,(with a LADDER not STAIRS)to comfortably accommodate up to six (6) guests. Fresh linens are provided. Two baths, modern kitchen with several small appliances. 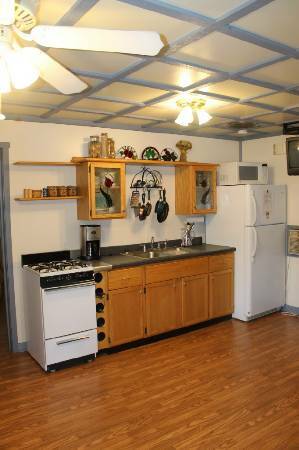 Washer and dryer.Ceiling fans and air conditioning lend personal indoor climate control. TV/VCR with DSS satellite basic family programming. Outdoor gas grill and campfire pit.In ground swimming pool with privacy fence (open Memorial Day week-end and closes Labor Day. Coming in from the South...piece o'cake. From Bristol, VA?TN-take I-81 North to Abingdon, Va. Exit 19 onto Route 58 East through Damascus toward Konnarock. Route 58 turns right after the bridge. Stay on Route 58 until you see the brick church on the left. Make a right turn on Green Cove Rd. SR 600. Green Cove Getaway is 2 miles down the road on the left. Coming in from the North....a challenge! Take exit #35 (Chilhowie/Saltville). Left off of exit onto route 762 (Whitetop Rd.) Travel on this road, 762 for 14.2 miles. Turn left on route 58. Travel approx. 4 miles then turn right on Green Cove Rd. (Rt 600). Travel 2 miles and turn left into the driveway of Green Cove Getaway. Details for the first. 14.2 miles. We recommend that you reset your odometer as you turn onto 762 from I-81. On this 14.2 miles, the road changes numbers and names, but do not rurn off and you will be OK. Below are the details of the road number and name changes. After traveling 3.6 miles the road number changes from route 762 to route 600. (This occurs at the four-way caution light. Continue straight-do not make any turns.) It will still be Whitetop Rd. Continue on route 600 (Whitetop Rd) for 11.3 miles. You will see a store building on the left. After passing the store, the road bears right and the number changes to route 603 (Konnarock Rd.) This road will come to route 58 at the 14.2 mile point. Stay on the road until you see a brick church on the left. Make a right turn on Green Cove Rd, SR 600. Green Cove Getaway is 2 miles down the road on the left. 36 0 37.223 N - 81 o 39 486 W.
The Getaway across from the Va. Creeper Trail. 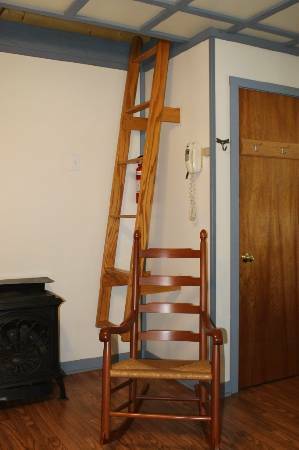 ladder going to the loft. This property is clean, modern, and comfortable. As soon as we looked around the Getaway, we wanted to extend our 3-day reservation to a full week (it was already booked). 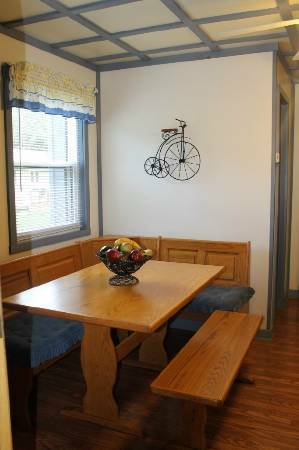 It is right along the Virginia Creeper rail trail so it is perfect for riding a bicycle or hiking. We stayed during the first week of Oct and the turning leaves were beautiful. Be sure to attend one of the festivals in the area if possible - the locals are some of the friendliest we've encountered. The owners are a very special couple - and went far out of their way to make sure we were comfortable. We are already planning our next stay at the Green Cove Getaway. It is difficult to find the words to describe this little piece of paradise. For us, it was a glimpse of the peace of the Kingdom promised to us by God the Creator. Time seemed to stand still for us during the 4 days we stayed at Green Cove Getaway...we ate when we were hungry and slept when we were tired...no schedules existed for us. Every day was a new adventure...walking the Va. Creeper Trail, seeing a mother doe feed her baby fawn, watching the sheep grazing the pasture right across the road from the bungalow, seeing the birds swoop down to pluck cherries from the tree at the end of the driveway, and many other once-in-a-lifetime events. John and Mary are two of the most wonderful people we have had the good fortune to meet, and we consider them family members now. Green Cove Getaway is the only place we will ever consider for a vacation from now on. It was truly life changing for us, and we thank God we found it. We will be returning in September!! This cottage is one of the greatest places to stay! My husband and I stayed from May 1st thru May 8th, 2004. The owners Mary and John couldn't have been nicer. They are close by if you need anything, and always there to help. The weather was not quite warm enough for us to swim at the beginning of the week, but Mary and John opened the pool for us anyway and heated it so we could swim. It is very clean, quiet and more relaxing than you can imagine. Anything you would need in the way of supplies, linens or kitchen products are all provided. It's far enough out to enjoy the mountains and still close enough to town to pick up anything you forgot to bring. 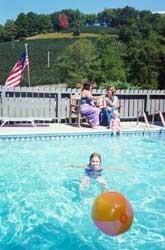 The kids would love the pool and the yard to play in and the parents will be thankful for the hot tub is relax in after the rest of the family has turned in for the night. Reserve this cottage and you won't be sorry!!!! This vacation rental is FANTASTIC!!!!! The hosts are incredibly kind and make their guests feel right at home. The pool is wonderful and great for sunny weather---though our children swam in the rain also!! The hot tub is a luxurious way to unwind for a quiet night's rest. This property is very well maintained! If you're looking for a quiet get away in surrounded by the beauty of nature---this is it!!!! We just came back from our mini vacation at the Green Cove Getaway and I can't stop thinking about the beautiful mountain scenery I was so lucky to see everyday. Mary and John are such nice people and made us feel very at home. We also biked the Virgina Creeper Trail which was such a treat for us. This area of Virginia is so quiet, peaceful and very scenic. Everyone was so friendly too. I hope to see it again some day. Thanks to Mary and John for making us feel at home. This is one of the best vacation spots we have ever found. We enjoy the outdoors, swimming, fishing, hiking, and biking. There is bike rental in nearby Damascus for those who do not have their own bikes. This place has a private pool and a hot tub. The owners have become just like family and we highly recommend you vacation there. The 2003 season will be our third year to stay there and we enjoyed it so much in the past that we are going to stay two weeks in 2003. The first year we stayed there my 87 year old mohter joined us and was able to walk on the Virginia Trail. It is a rail to trail well kept area with great trout fishing. The cottage is clean, and well kept. You can't miss if you choose this one. We thoroughly enjoyed our stay. There were four adults and three children (three generations of our family!) and we all had a GREAT time. Loved the house and the trail. We were there October 5,6, and 7. 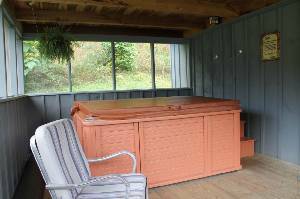 The pool was closed for the winter, but the hot tub was a wonderful way to relax after a long day on the bikes. We spent a great week-end here September 10-12, 2002. 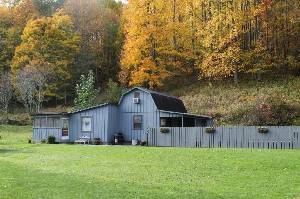 The cabin is directly across the street, about 100 feet, from the Virginia Creeper Trail so you can bike or hike all you like. There is a heated pool directly out the front door and a hot tub out the back door. Both very well maintained. 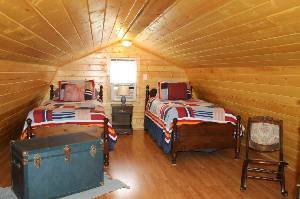 The cabin is extremely clean with all the comforts of home. The surrounding area is beautiful with a Christmas tree farm covering a hillside for your view. We had a beauiful, clear, postcard sky to enjoy. This place is perfect if you are looking for a quiet, private, out of the way place. We will be returning! Thanks Mary! Other Fees: More than 6 people there is a fee of $l0.00 per person.